Day 12, the last day of the Northland trip. It was a great trip and I would like to do it again! Left Auckland around 8:30am knowing that I had about 8 hours ahead of me. Rode SH1 south to SH39. C4,R8,T5,V5. Probably the smoothest road you will get in NZ and still a bit of curve. A pretty standard hwy. SH39 to Otorohanga. Took this short cut down SH 39 instead of SH1. C6,R7,T4,V7. Nice ride through NZ farmland despite lots of big truck traffic. On to SH4, which is awesome. Stopped at Taumerunui for lunch. C7/8,R5/6,T2/3,V7/8. Taumerunui to Wanganui. 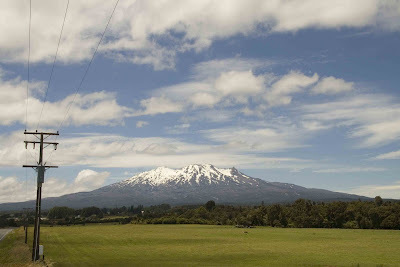 Great views of Mt Ruapehu. Unfortunately it looks they were in the middle of a straightening project for the section of road closer to Wanganui, boo! C9,R5/6,T3,V9. Back to the Batcave. The boys back in their box. Great trip and as always good to be home.